Navigation systems: Decca Navigator Mk-12 & dropped reference buoys. + Manual triangulation of parked-car headlamps on cliffs. associated with an Ouvrage (fortress) on the French WWII defensive Maginot Line. 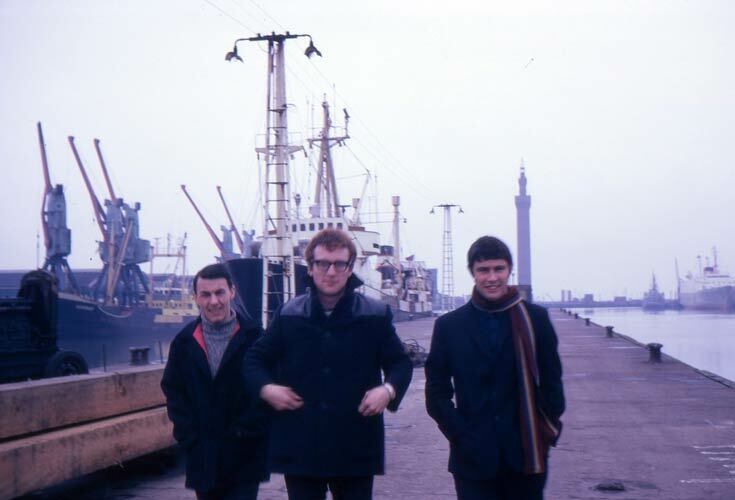 Three Marine Operators going ashore (Hull docks). The Frode Viking can be seen behind them. Detonators with boosters were used to detonate the charge. Shooting platform being used on the starboard side. (and hence explosive charge) away from the floating streamer cable - to avoid blowing it up. 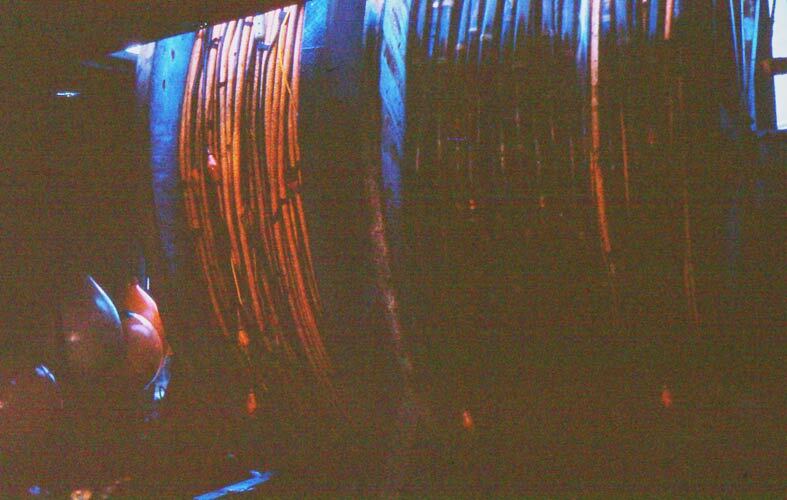 In this enlargement the large 50 lb canisters of explosive can be clearly seen. 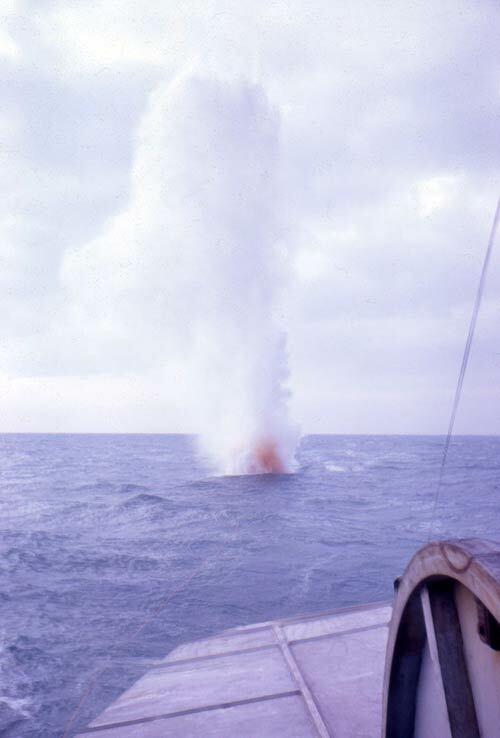 The explosive charge detonating underwater behind the ship. breakdown of the Ammonium Nitrate. sometimes made the mistake of swooping down prematurely. The Cable Drum with the orange Floating Streamer Cable. The red hydrophones can be seen hanging from the cable. 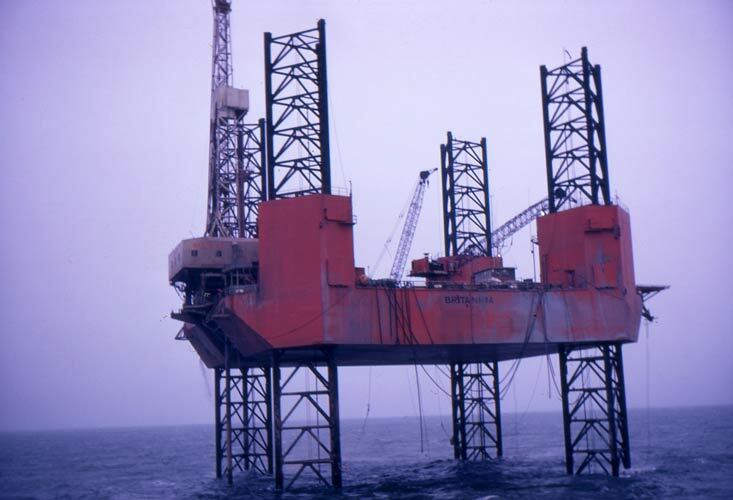 A "Jack-up" oil drilling platform in the North Sea (1968). 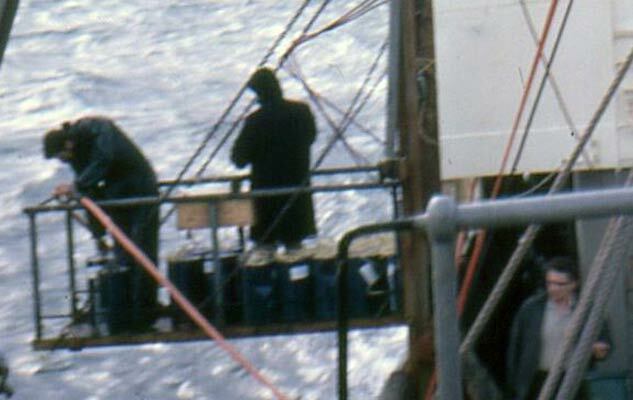 Production oil platforms (well-heads) in the North Sea (1968). Ammonium Nitrate (NH4NO3) explosive will detonate powerfully but requires a very strong shock wave to make this happen. A standard pentaery-thritol tetra-nitrate (PETN) detonating cap will not normally initiate detonation, so a booster detonator has to be used. (cap) into the canister. Then he would have to attach a wire from the canister (& detonator) to a metal ring located round the "firing line" (the cable trailing from the platform to stern of the ship). 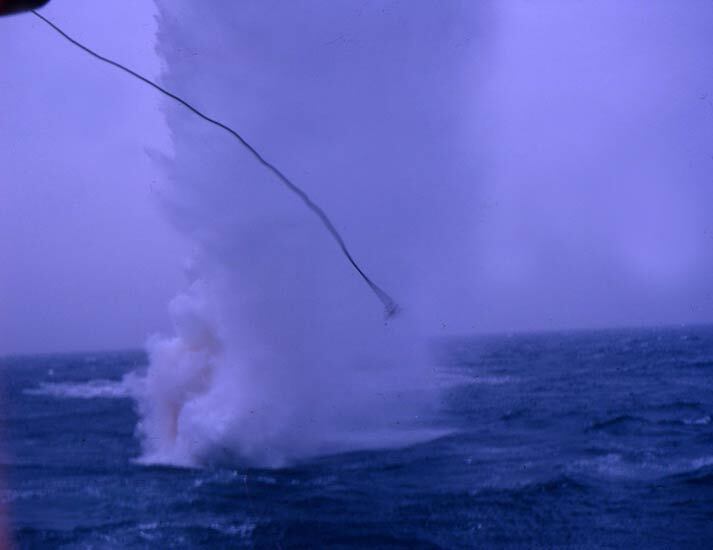 The canister was then released into the water and slid back past the stern of the ship underwater until the metal ring was stopped by a metal ball at the end of the firing line. 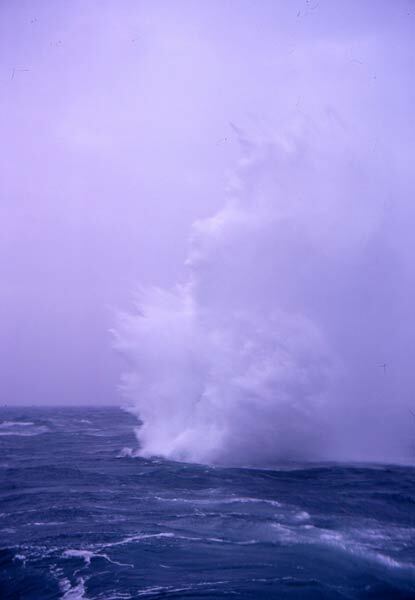 The charge was detonated by sending a high-voltage pulse from a "blaster" down the firing line (at exactly the moment when the ship was positioned over the "next" shot point). The timing of the high-voltage pulse was controlled by the Navigators on the ship's bridge pressing a button. The Shooter would have to close a safety switch (called a "dead man's handle" before the charge could be detonated. This sequence was repeated every 40 secs or so until the whole "Line" was surveyed. The dead man's handle was introduced after another vessel had an bad accident. The firing line had become chipped or cracked exposing the high-voltage inner metal conductor. After the charge was released down the firing line, the metal ring jammed in the crack - leaving the charge hanging next to the ship's side. The Shooters had no time to warn the Navigator & the blaster was triggered, the charge blowing a large hole in the ship's side. I saw this ship myself in the repair dock. The canisters of explosive were retrieved from storage in the ship's hold by lifting them out in a rope net hung from a crane. Once I witnessed a canister slip out through a hole in the net and fall way down onto the hundreds of canisters in the hold below - smashing open it's contents of explosive. Close call! This "primitive" hydrophone cable used individual hydrophones hanging down from wires along it's length. The cable had to be "Still" in the water (no forward movement) during the time of the shot detonation and the following data recording period (6-secs maximum) or the water noise would swamp any seismic echoes from underlying rock layers under the sea bed. To achieve this, the cable had to be released just before the shot. Consequently, the cable had to be winched back in after the data recording, ready for the next release. This was called the "Reel-free" system. 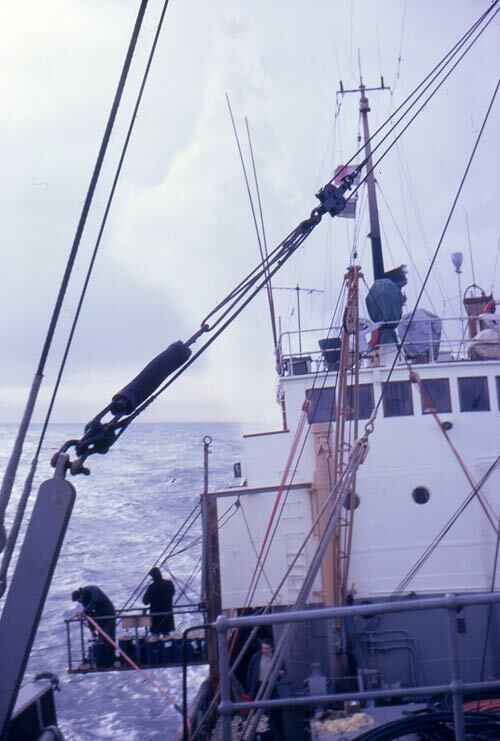 A large winching force was needed to retrieve the streamer cable as the ship would be moving ahead along the survey line at about 5 knots - and the front end of the cable suffered a lot of wear. 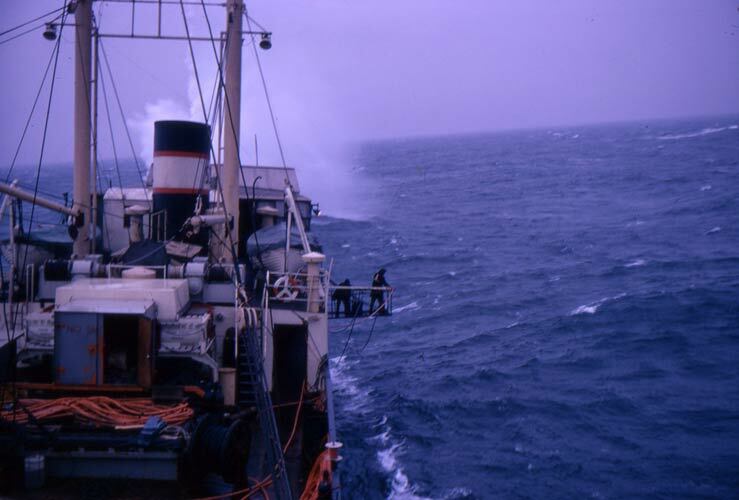 Sometimes the steel cable snapped before a line could be completed & and a lot of effort would have to be spent finding & retrieving the cable from the sea (particularly in heavy seas when it was difficult to see the cable in the water. Also great care had to be taken not to get the broken cable wrapped around the ship's propeller during recovery. Diving equipment was available in case this happened. The Decca Navigator system was highly prone to "slipping a lane" if signals became weak or dropped-out - which often happened in bad weather. Being 1 or more lanes off was not too bad for a fishing vessel but disaster for an precision oil survey. To reset the Navigator it was normally necessary to sail back to the coast or a port (very inconvenient and expensive if the ship is in the middle of a survey hundreds of miles from shore) and take visual sightings of known objects to locate the ship's true position. 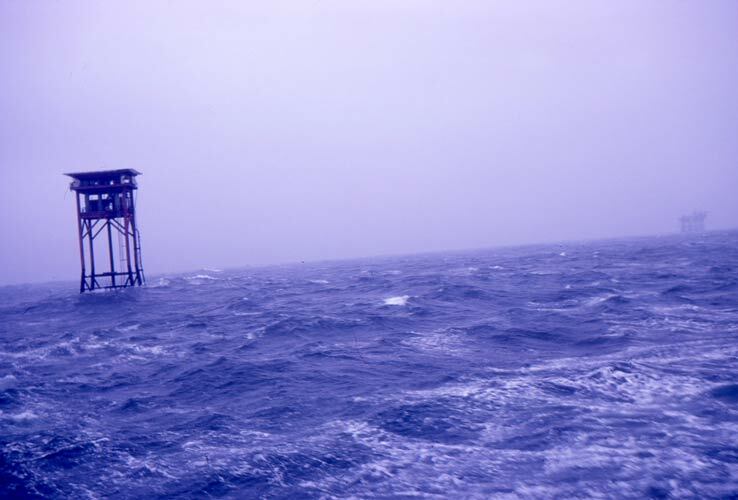 To overcome the necessity of sailing back to port, the ship would "carry" the navigation signal out to sea (good signals, good weather) and then drop a reference buoy in the survey area. The ship would pass by the buoy taking position fixes until it's position was well recorded. 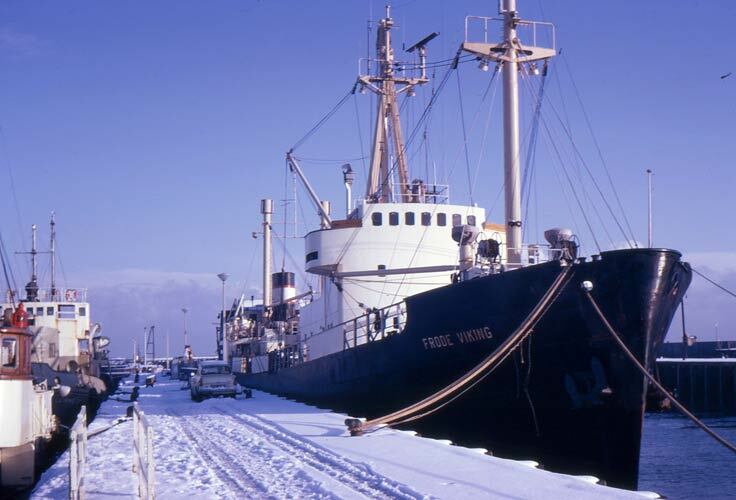 The construction of these buoys was one of the important skills taught to Marine Operators on the Frode Viking. Rope splicing was one of the first skills learnt. A rope was "spliced" to a stick buoy (a buoy with a pole passing through it) at one end and to TWO concrete blocks with embedded loops at the other end (using a "link" rope to attach the second concrete block). Small anchors were sometimes added. A flashing light was attached to the upper section of the buoy's pole and weight to the lower end of the pole. The length of the buoy rope was determined from the water depth reading on the bridge echo-sounder and had to be exactly measured. Too short and the buoy ended-up underwater with it's light flashing eerily in the dark waters (this could happen with a false echosounder depth reading due to a undersea temperature or salt inversion layer). Too long and the buoy would swing out of position with wind and tide & be useless as a position reference. Just long enough was also problematic as the swell from heavy seas could cause the rope to repeatedly tug on the concrete blocks and move them out of position. Deploying the reference buoy was a dangerous operation. At the given signal the heavy concrete blocks were released down the steep ramp at the rear of the ship (Stern Trawler ramp) into the sea - pulling the rope behind it at great speed (the blocks were sinking and the ship was moving). The rope had to be layed-out so that it would not catch on anything (or anybody) as it fed-out. The buoy had to be released by hand down the ramp and into the sea before the rope tightened and whipped it from the deck. This was very hazardous for the person handling the stick buoy as it was possible to get entangled in the rope. Apparently this happened to an operator from another crew and he was later seen floating underwater at the end of the rope. The instrument for creating the chart of accumulated data from the seismic recording process was called a VAX (standing for Variable Cross-sectional area recorder) and this used standard X-Ray film - which was very sensitive to light. The chart was called a VAX section. The width of each recorded line on the section was proportional to the instantaneous received signal strength from the corresponding hydrophone group on the streamer cable. The result (after film development) was 24 varying-width parallel black lines on a transparent film. Strong echo returns from hard rock layers under the seabed resulted in a (usually curved) line of wide pulses visible across the VAX section. There was an on-board darkroom on the Frode Viking which was completely light-proof. The VAX film cassette had to be loaded with X-ray film in complete darkness (no safe light) - which took considerable skill. The film came in plastic containers about 18 inches long which had to be unsealed & opened in the dark, the film removed and then loaded into the VAX cassette and the cassette then sealed. After VAX recording was completed at the end of a survey line, the large roll of film then had to be removed from it's cassette and developed in the darkroom - again in complete darkness. This was difficult enough in calm weather but in rough seas one was thrown about with no visual reference while trying to immerse the roll of film in the chemical developer bath for a precise length of time before transferring it to the washing tank to remove the developer & then performing the drying process. This was accomplished by recording one data scan with the Leach digital data acquisition system at 200 bits per inch instead of the normal 800 bits per inch used in seismic recording. 200 bits per inch = 5/1000 inch (5 thou) spacing of the recorded data bits on the 9-track magnetic tape. The recorded section of tape was cut off the reel and the "header" section of the recording was located using a special hand-held viewer that indicated the magnetised (recorded-on) sections of the tape. This section of the tape was then dipped in MAGNASEE (a suspension of very finely ground iron oxide in a liquid) and the iron oxide powder stuck to the magnetised data "bits" on the tape. A piece of clear Sellotape was then pressed onto the magnetic tape and the bit-pattern transferred to the Sellotape. The Sellotape was then mounted on (stuck-to) a clear 35mm slide & the slide was projected onto a wall screen with a slide projector. In this way the recorded data could be examined and checked to ensure that the data acquisition system was operating correctly.